It’s some time since we were last at the Slieve Russell , but some things never change. 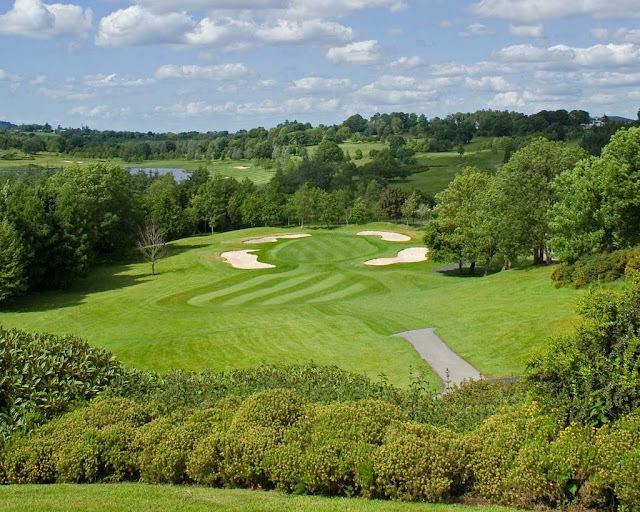 We were attending the IVEA Annual Conference and the only minor setback was, having to arrive at 9.00 for the golf, which meant that we had a four hour wait for a room (well Josephine did). It says something for the popularity of the venue that they had three functions filling the hotel on a Tuesday evening and ours and a wedding following on the Wednesday. Breakfast was magnificent although, as we did not have a room, they charged us €16 a piece for the privilege. I left Josephine in the lounge and headed for the club house in a downpour that brought gasps of horror from the assembled golfers, however, by the time we were on the first tee the rain had passed and the sun was making a valiant effort to bring some cheer to the proceedings! I will not dwell on the golf except to say that the course is one of the very best in the area with some great holes and beautiful vistas; posh word for views! My partner Joe McGrath, almost a local boy, managed to keep his nerve and came out winner of the competition. Our room was spacious and, happy days, had a separate shower so no clambering over the edge of the bath. The Wi-Fi also worked without any problems and was free. I was checking our clothes later in the afternoon and realised that our suit/dress bag was missing so went down to collect it from reception. Disappeared! For the next couple of hours there was a certain amount of pandemonium as the staff tried to find out where it had gone. No names, no pack drill but a very old friend of ours had lifted it instead of his own and only realised much later that he really did not need a dress – Well done Ted! Breakfast was as good as the previous day and this time included in our package! The conference proceeded well with visits by Ruari Quinn, Minister for Education, and another Junior Minister, who both made presentations to the conference. A nightcap in the bar, they still give one the port bottle to make a brandy & port, was enough and we turned in. Unfortunately we did not get a chance to make use of the Spa but it was, altogether, a well spent couple of days in delightful surroundings. There's only one good looking one! 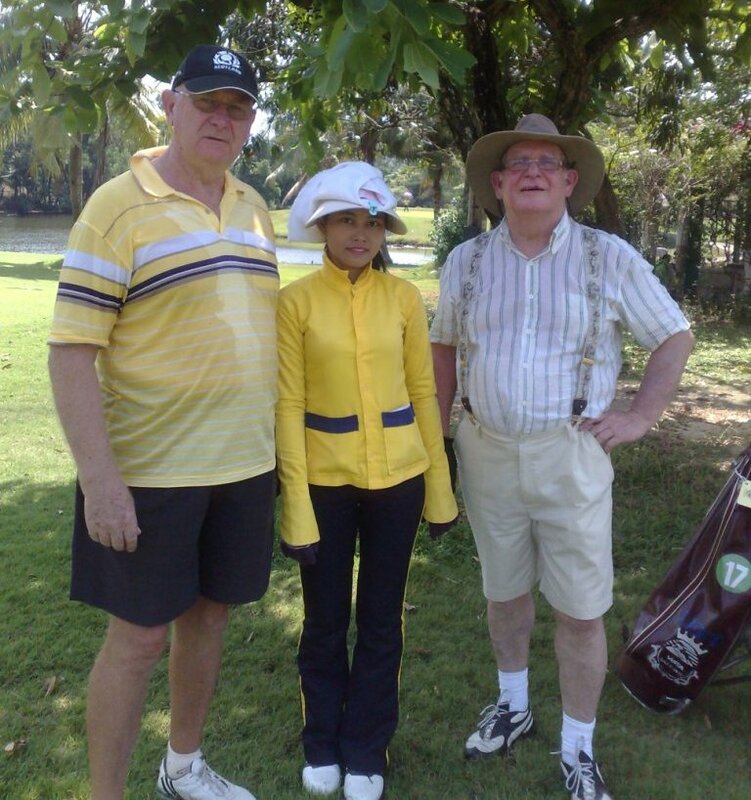 This is an awfully belated post on golfing with Sandy McKinnon in Thailand and is really just an excuse to publish the photographs. For those of you who were at 13 Sigs from around ’60-’64 and/or 9 Sigs from ’64-’69 you may well remember Sandy; and Kay as well during the Cyprus stint. They now live for most of the year in Bangkok and were good enough to invite Josephine and I to stay with them in March on our way back from Cambodia. 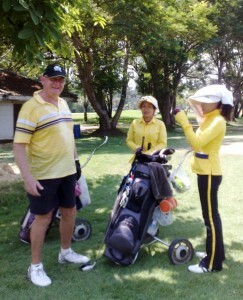 Unfortunately the photographs from my camera have disappeared into the ether but a couple taken on my mobile on the Muang Ake Vista golf course have survived. (surprise! surprise! ).